Here's what I wrote for the University of North Carolina Press blog, on the occasion of Medicare's 50th birthday. Medicare is the protagonist of my new book, Old and Sick in America: the Journey Through the Health Care System, published by the UNC Press. Fifty years ago this summer, Medicare celebrated its first birthday. After 30 years of unsuccessful attempts to introduce national health insurance, Congress finally took what was supposed to be its first step in the direction of comprehensive coverage, creating the Medicare program for older Americans. The consequences were profound: Medicare has influenced how older people die—where they die, and what they die of—and it has affected how older people live—longer and with less disability. Every site where older people receive medical treatment has been shaped by Medicare, from the office to the hospital to the skilled nursing facility. Medicare did not achieve all this at once, although already after one year of existence, older people were flocking to the hospital as never before. They were finally tending to those nagging symptoms they had previously neglected or the elective surgery they had put off because they couldn’t afford to go to the hospital. Over time, Medicare evolved to adapt to new realities and to meet new challenges. Medicare hospice, for example, was non-existent in the early days of the program; the benefit was first introduced through federal legislation in 1983. In its first year of existence, only 200 older people enrolled in hospice, accounting for less than half of one percent of all deaths. By 1986, 7 percent of Medicare patients who died had been enrolled in hospice; by 1998, that percentage had jumped to 19 percent, and in 2013 it soared to 47 percent. Home care started to become a reality for older Americans after Medicare was expanded in 1972 to cover physical therapy and occupational therapy; it became even more of a reality when federal legislation permitted home services without a prior hospitalization and allowed for-profit agencies to provide the services. The availability of medical care at home—though with the conspicuous absence of physician care—became crucially important after the introduction of prospective payment for hospital care in 1983, which in turn led to dramatically shortened hospital stays. As older individuals were discharged “quicker and sicker,” they desperately needed help, and they quickly learned they could get it through home nursing, home physical therapy, and home health aides—paid for by Medicare. In a time when the integrity of the Medicare program is under threat—make no mistake, today it is Medicaid that is on the chopping block, tomorrow it will be Medicare—it behooves us to celebrate the program’s successes. For those older people who were just too debilitated to go home after a hospitalization, even with home care services, another alternative was rehab. This kind of inpatient care, typically provided in a skilled nursing facility (SNF), was virtually unheard of in 1967. It was covered by the initial Medicare legislation, but only took off after prospective payment shortened hospital stays. Today, one in five older patients goes from the hospital to the SNF. Changes to the Medicare program continue unabated to this day, modifications that have profound ramifications for all older Americans. The “value-based care” required by the Affordable Care Act is now embedded in the way that Medicare pays for joint replacement surgery: instead of paying the orthopedist, the hospital, and the skilled nursing facility separately for their work, Medicare instead pays the providers a single “bundled” fee that they must apportion among themselves. This means that no longer will the orthopedist be able to wash his hands (it’s usually a he) of what goes on the rehab setting, nor will the hospital regard discharged patients as out of sight, out of mind. In the drama in which the protagonist is the patient with a painful knee and trouble walking and the action revolves around an operation, all the players have to cooperate to make the outcome successful. Thanks to the Medicare Readmissions Reduction Program, hospitals can no longer discharge patients with impunity, before their problems have been adequately attended to and without a robust follow-up plan in place. In a time when the integrity of the Medicare program is under threat—make no mistake, today it is Medicaid that is on the chopping block, tomorrow it will be Medicare—it behooves us to celebrate the program’s successes. We also need to look closely at how the health care system works, how all the pieces hang together, and the unique opportunity that Medicare presents in the form of a lever with which to manipulate this complex system. I thought of calling the book, “Merchants of Health: How Doctors, Hospitals, Drug Companies, Device Manufacturers and Government Shape the Experience of Illness,” but that title didn’t say anything about old people. I considered calling it, “Journey through the Health Care System: Aging and Ailing in America,” but both my husband and my editor thought that “ailing” sounded archaic. Then there was, “In the Home of the Sick and the Land of the Aged: How the Health Care Colossus Shapes the Patient’s Experience of Illness,” which didn’t make clear what I meant by the health care colossus. I considered using the title of this blog, “Life in the End Zone,” but the football metaphor didn’t quite work. My editor wanted something short and to the point that made clear what the book is about. 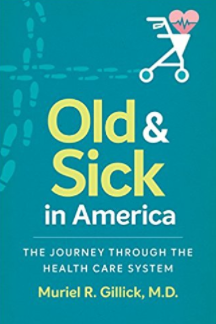 So it’s called “Old and Sick in America” and the subtitle is “the Journey through the Health Care System,” because I take the reader on a journey, beginning with a visit to the doctor’s office, then to the hospital, then to rehab, and finally back home. The book is out TODAY! 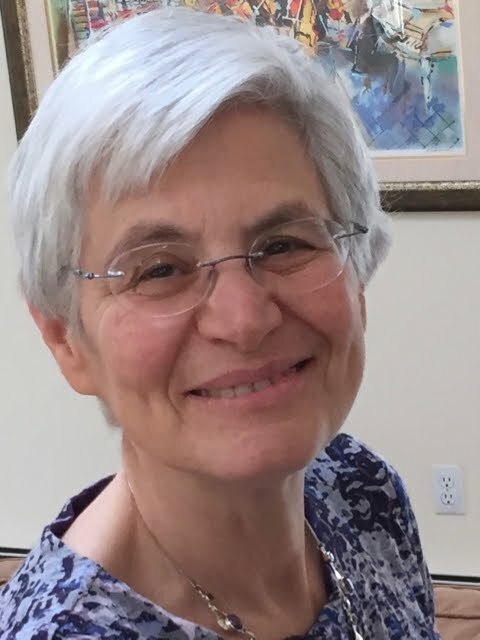 “With this book, Muriel R. Gillick offers a satisfying balance of insight, compassion, and evidence about the many ways that Medicare has transformed the way older Americans live and die. Fusing the skills of the social scientist with those of a physician, Gillick combines compelling personal stories and clear-eyed analysis into a very readable whole. Old and Sick in America is a book that those of us with elderly relatives, or on Medicare ourselves, need to read." It’s available from the University of North Carolina Press, from Amazon (paperback $29.95, Kindle edition $9.99) and other sellers. Why Do We Need Health Insurance Anyway? Despite the seemingly endless barrage of articles stimulated by the equally endless efforts of the Trump administration to kill the Affordable Care Act, relatively little attention has been paid to why we need health insurance in the first place. Liberal Democrats assert that health care is a “right” and right-wing Republicans maintain that it’s a “privilege” and that the only business government has with health care is to facilitate the business of medicine. Some of the disagreement among the parties stems from differing assumptions about just exactly what health insurance is for. Is it to protect people in the event of catastrophe—a devastating car accident that results in multiple operations and an extended hospitalization, or metastatic cancer that triggers several rounds of chemotherapy, radiation therapy, and numerous hospital stays? Or is to maintain individual and public health—ensuring that people receive immunizations and cancer screening, along with treatment of high blood pressure and high cholesterol? We can begin to answer the question by looking at the example of one group in American society with universal coverage, the older population. Medicare (and its sister program, Medicaid, providing insurance coverage for poor people) went into effect on July 1, 1966, after what was effectively a 30-year battle. Franklin Roosevelt wanted the government to provide health insurance for everyone, but couldn’t make much headway with his idea; Truman campaigned actively for health insurance for all Americans, but his plan failed. Finally, after decades of wrangling, Congress and President Lyndon Johnson agreed to begin with those in greatest need: people who were either old, poor, or both. Medicare had the immediate effect of boosting the number of older people hospitalized—suddenly, they stopped neglecting that chronic cough that turned out to be lung cancer or decided to get medical attention for that stomach pain that proved to be an ulcer. The likely effect (though to be fair, it’s hard to disentangle the effect of Medicare from the effect of other concurrent changes) is that older people began to live longer—a lot longer. But what was really striking were the countless indirect ways in which Medicare promoted the health of the entire older population: for example, by promising to pay for effective technology, it stimulated the development of incredibly successful interventions such as the pacemaker and the artificial hip. When we compare the health of Americans to that of their counterparts in other developed nations, we find, rather shockingly, that everyone else is generally better off than we are—if they are under 65. Among older people, the stark differences between the U.S. on the one hand and Europe, Australia, and Japan on the other hand vanish. The only plausible explanation is that older people in the U.S. all have health insurance, rendering them comparable to older people in other parts of the world. From a population perspective, ensuring that everyone has health insurance is desirable because health is desirable. Good health is like education: without it, we are not productive, creative, prosperous, or happy. Health insurance is the means to assure good health, so just as public education is a means to a skilled labor force. Environmental regulations are the means to assuring a safer, more healthful country. From an individual perspective, health insurance is critical to well-being because it’s the gateway to good health. It’s simply not true that we can expect to stay perfectly healthy as long as we eat well, exercise, and lead a virtuous life. We never know when disease will strike, whether in the form of cancer or heart disease or a chronic neurologic disorder such as Alzheimer’s disease or multiple sclerosis. No matter how cautiously we drive, we cannot guarantee that a drunk driver won’t unexpectedly plow into us, causing no end of medical problems if we survive the crash. Nor can we expect that the cost of even routine medical care will be affordable: a plain x-ray, used to diagnose pneumonia and other lung conditions, typically costs hundreds of dollars when you add up the cost of the procedure and the cost of a radiologist’s reading. Everyone needs basic medical care and it’s not just “catastrophic care” that is expensive. Hence, the rationale for covering each and every American isn’t just that health insurance only works when everyone shares the risk—though it is true that the only way to keep premiums manageable is for everyone, the sick and the healthy, to have coverage, rather than confining coverage to those who are known to be sick and are guaranteed to use huge amounts of service. The rationale for covering everybody is that health care is essential if we are to have enough energetic, healthy, educated workers to provide the services and the innovations that we all need, and the only way to make sure that everyone has access to health care is to provide insurance. Health care, and the insurance coverage to pay for it, isn’t a right, nor is it a privilege. But it is critical to promoting a strong, vibrant, capable citizenry. Is Medicare Entering the 21st Century? The do-nothing Congress may be doing something. In the immediate aftermath of the Senate’s third and hopefully final failure to “repeal and replace” the Affordable Care Act, the Senate actually passed a health care bill unanimously. With little public fanfare, it approved CHRONIC (the Creating High Quality Results and Outcomes Necessary to Improve Chronic Care Act of 2017). This bill, if it is not eviscerated or rejected by the House, takes a few important steps in the right direction. As a useful summary in the Health Affairs blog explains, the bill supports changes in four domains: home based care, managed care, telehealth, and accountability. In the arena of home based care, the law extends the successful “independence at home” demonstration project for two years, increasing the number of participants from 10,000 to 15,000. This is a relatively small modest program that does something critically important for some of our sickest and most complex patients—it moves the nexus of care from the hospital and the office into the home. In the area of managed care, the law does something quite remarkable. It incentivizes further use of Medicare Advantage programs, a long-standing Republican objective since they see Medicare Advantage as a way of privatizing Medicare. But one of the ways it does this is to allow programs to expand benefits to include social supports and help with activities of daily living. It’s a tiny wedge that could signal the beginning of a recognition that social factors contribute to health. This is the message of the book, The American Health Care Paradox by Elizabeth Bradley and Lauren Taylor in which they argue that the reason Americans spend so much more per capita on health care than any other developed nation—and achieve poorer results—is that we substitute medical benefits for social benefits, to the detriment of well-being. We are a long way from allowing federal money to be used to pay for gardening supplies, say, so that a person with dementia would be happy puttering around at home and not become agitated and restless, perhaps triggering pharmacological treatment or even nursing home care, as has happened in the UK. But it’s a start. The telehealth expansion is another one of those strategies, such as electronic medical records, that on the surface is very appealing, but for which the evidence of effectiveness is mixed. It feeds nicely into the conviction that there are technical fixes to the American health care system, rather than major structural problems that must be addressed. Probably not the best use of scarce resources, but not a terrible idea. Finally, the Act mandates that the GAO carry out three investigations to assess the consequences of various strategies that have been piloted or proposed. One of these is a special reimbursement code for physicians to formulate a comprehensive care plan for patients with certain serious conditions. Another is whether Medicare Part D should lift its ban on drugs that help patients lose weight. The GAO is usually thorough and unbiased in its evaluations. All sound efforts at systematic evaluation—as opposed to wholesale, uncritical adoption of policies and programs—should be supported. Will the House pass the bill? Will it discover the most interesting parts of the legislation, ie the provision that lets Medicare Advantage programs offer benefits that are not “medical” in the conventional sense? We shall see. Tell your representative that if s/he wants to take credit for something, this would be a good place to start. Admissions to American Intensive Care Units (ICUs) from hospital emergency departments are on the rise—they doubled from 2003 to 2009—and admissions among patients aged 85 and older growing the most rapidly of all: they increased 25 percent every two years. What we still don’t know is whether or when the ICU helps them. This past week, French researchers published a study in which they shed some light on the question. What they found is that ICU admission in basically high functioning people over age 75 did not improve their chance of survival—and may have made it worse. The ICU probably didn’t make any difference in their level of function or health-related quality of life six months after discharge (if they were still alive)—but there is some suggestion it caused a deterioration. In a nutshell, what the researchers did was to come up with a standardized protocol for determining who should be admitted to the ICU, based on the particular conditions they had and how severe the conditions were. They then randomized hospitals to either use this special protocol or to rely on whatever they normally did to make decisions about ICU admission. To be eligible for the study, you had to be at least 75 years of age and at baseline, ie before you got acutely ill, you had to be independent in almost all your daily activities. When physicians used the special triage system, older patients were far more likely to be admitted to the ICU (61 percent) than when they did not (34 percent). But the death rate in the ICU, and the length of stay in the hospital were the same in the two populations. Overall hospital mortality was higher in the intervention group (30 percent) than in the controls (21 percent). Moreover, decline in independent functioning was greater at six months in the intervention group than in the controls. What should we make of all this? I think it’s reasonable to conclude something about what we're not doing. We’re not currently depriving many older patients of care that would be beneficial for them. Maybe all those physicians who don’t admit certain elderly individuals to the ICU aren’t discriminating against them; maybe they’re on to something. What we don’t know is whether the doctors who provide “routine care,” those who use criteria other than the officially sanctioned ones for determining who gets in to the ICU, are still over-utilizing the ICU. What we don’t know, although it’s a bit implausible, is whether there are older patients who are excluded both by the seat-of-the-pants criteria and the rigorously-determined criteria, who would nonetheless benefit from a trip to the ICU. Behind all the methodological considerations and the statistical conclusions, we have two inescapable realities: first, there are many older people who are so sick and so close to the end of life that no technology, no medication, no amount of monitoring or nursing care will keep them alive—and that’s true even for the population addressed in this study, which excluded anyone who was frail. Second, the ICU is a medical intervention, much like a drug or a procedure, and it comes with side effects. For older individuals, those side effects may outweigh any potential benefits of the intervention. So when the physician recommends the ICU for you or your older relative, think twice before agreeing.